Nearly a dozen Republican lawmakers are urging the Department of Education to release a comprehensive list of institutions involved in any partnership with Chinese technology giant Huawei amid national security concerns. In a letter sent Friday to Secretary of Education Betsy DeVos, lawmakers raised concerns about ongoing Chinese efforts to acquire U.S. technology and intellectual property on American college campuses. The letter, publicly released on Monday, serves as a follow-up to a June request by Congress that the department require American universities working with Huawei to hand over all documents and information related to that relationship. "The Chinese government is playing a long-game, trying to infiltrate our institutions and steal intellectual property under the guise of Chinese telecommunications companies like Huawei," Rep. Jim Banks (R., Ind.) told the Washington Free Beacon. "We cannot be naïve to the threat they pose—they will, and likely already have, exploit the openness of our universities for their gain. While I am pleased that the department responded to my original inquiry, there are specific questions that still need answers." The 11 signatories, led by Banks, include Republican representatives Austin Scott of Georgia, Dana Rohrabacher of California, Chris Smith and Frank Lobiondo of New Jersey, Mike Conaway of Texas, Walter Jones of North Carolina, Mike Gallagher of Wisconsin, Elise Stefanik of New York, Doug Lamborn of Colorado, and Vicky Hartzler of Missouri. In a reply to the original request, DeVos said the department had scheduled a briefing on the matter. Lawmakers pressed her on whether such a briefing had occurred and, if not, whether the FBI or Department of National Intelligence would lead the meeting. Both agencies have warned of Chinese infiltration on American college campuses. The group also asked DeVos to release information regarding any research personnel, including Chinese nationals involved in talent programs, at universities that are involved in research activities connected to Huawei. Banks and Sen. Marco Rubio (R., Fla.) said in June that Huawei's partnerships with more than 50 U.S. universities "may pose a significant threat to national security" given China's history of exploiting America's economic openness to dominate the tech field. 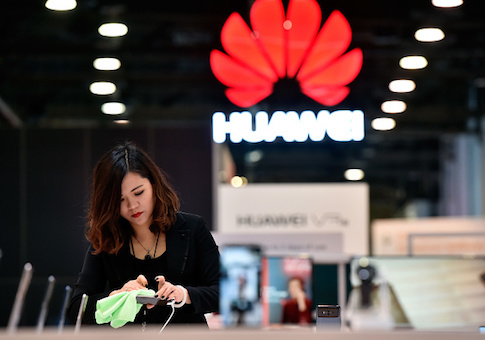 U.S. intelligence agencies have warned for years of Huawei's ties to the Chinese government and People's Liberation Army. The company denies all connections to the PLA. This entry was posted in National Security and tagged China, College Campuses, Department of Education. Bookmark the permalink.